iPad counters display a recessed Apple tablet under magnetized overlay! 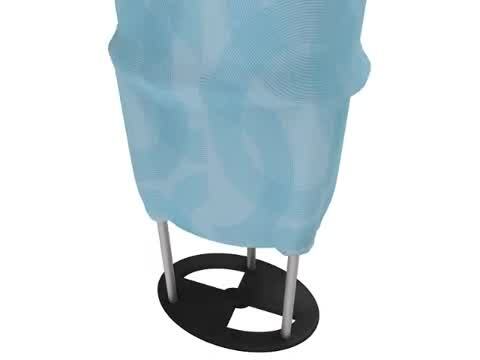 Zippered polyester wrap provides access to hidden space for storing items! Convenient carrying bag included for transport between events! Artwork templates to design your own full-color, dye-sub cover that really stands out! Plain black stretch covering also included for your convenience! 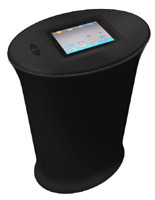 These customizable iPad counters are a tech-savvy addition to trade show booths, car dealerships & more! 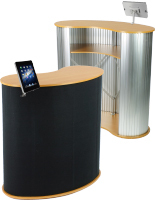 The stands attract potential customers, clients and patrons. 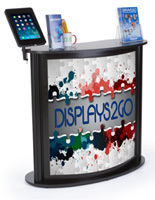 iPad counters that assemble quickly, also known as portable kiosks, provide an area for interaction between business representatives and trade show attendees. If your company has an app available at the Apple store, this stand allows customers to preview it at a trade show booth. These iPad counters that incorporate full color images feature your unique design to catch the eye of passersby. These stands are also a great choice for offering additional information about artwork or exhibits at galleries or museums. 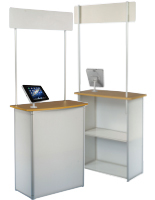 These stand-alone kiosks, enclosed Apple iPad counters bring the most popular Apple app or applications directly to the forefront of a business presentation. Like the iPhone, the handheld tablet is fun, easy-to-use and can be easily integrated into a marketing or promotions plan. 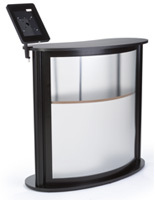 These kiosks provide a secure means of holding the electronic device and providing an area for interaction. Custom-printed artwork with a unique or eye-catching design, on a stretch fabric cover further enhances the value of this unique product. The top of the stand is crafted from MDF and features a magnetic covering to hold the tablet in place, as well as venting slots, and a hidden power cord hole, so the unit can remain charging and cool. The stretchy cover slides on easily. A zipper reveals a small storage area inside. The kiosks are lightweight and break down easily into the included molded carrying bag with adjustable shoulder strap.